The Greater Adjutant is a large stork reaching a body length of 145-150 cm with a wingspan of 250 cm. The plumage is black on the upper side of the wings and body, and whitish or light grey on the lower side. The pink neck and head are bald, adapted to life as a scavenger. Plumage on the head would quickly clog with blood and matter, a bald head is easier to keep clean. The yellow beak is long, thick and strong. Feeding not exclusively on carrion, the bird also eats small amphibians and reptiles. The Greater Adjutant inhabits tropical wetlands in South East Asia, breeding sites are however limited to Assam and Cambodia. The nests are built in trees; a clutch mostly consists of 2-4 eggs. Like other storks the species often forms colonies. Listed by the IUCN as endangered, this bird is mainly endangered by the loss of breeding places and the continuous loss of habitat. 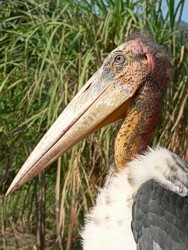 Smaller than his relative, the Lesser Adjutant reaches a body length of 110-120 cm with a wingspan of 210 cm. His long, thick and lightly coloured beak is slightly thinner. The plumage is black on the upper side of the wings and body, and light grey on the lower side. 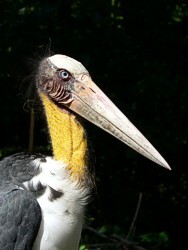 In contrast to the Greater Adjutant this species does not have a white ruff at the base of the neck or a large neck pouch. It mainly feeds on fish, but also small amphibians, crustaceans, crickets and small rodents. Loss of breeding sites and the continuous destruction of habitats – tropical wetlands in South East Asia – resulted in this species being listed as vulnerable by the IUCN. Various types of water birds are still common throughout the region and can be found in marshes, paddyfields, lakes, mud flats, pastures and mangroves. The long-legged Egrets and Herons catch fish, crabs and insects by stabbing them with their long pointed bills. Most ducks feed on vegetation in addition to small insects and aquatic organisms. 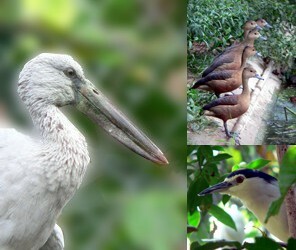 Different species of water birds, like Asian Openbill (Anastomus oscitans), Cattle Egret (Bubulcus ibis), Black-crowned Night Heron (Nycticorax nycticorax), Little Egret (Egretta garzetta) and Lesser Whistling-Duck (Dendrocygna javanica) are kept in the ACCB. Regularly hunted for human consumption, these birds can often be found for sale in local markets. Large scale hunting has substantially reduced the number of the larger species throughout the region. There are two kinds of raptors in the ACCB: two species of kites, the Crested Serpent Eagle (Spilornes cheela) and the Brahminy Kite (Haliastur Indus), and on the other hand an owl species, the Collared Scops Owl (Otus lettia). 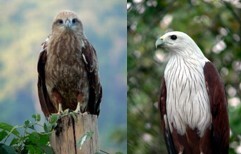 Brahminy Kites are up to 50 cm big raptors, which live at rivers, lakes and paddyfields all over Southeast-Asia. They feed on crabs, snakes, fish, frogs, insects and also carrion. The Green Peafowl is a large terrestrial bird that prefers open forest habitat such as dry deciduous forest with grassy understoreys and forest edges along ponds or rivers. In these habitats it can find its preferred foods of grain, seeds, shoots, buds, leaves, fruits, insects, frogs and lizards. Cambodia is one of the last strongholds of this species in the world. 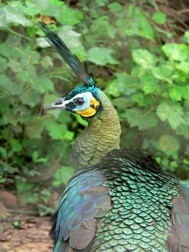 The status of the Green Peafowl in the Red List is vulnerable. The species’ decline is due to habitat destruction and hunting for their beautiful feathers, the birds themselves which are kept as pets, and their eggs. 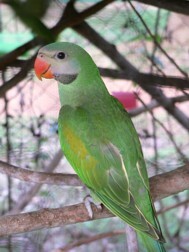 Furthermore, another bird species is kept in the ACCB, the Red-breasted Parakeet (Psittacula alexandri). This species is divided into seven sub-species and widely distributed over Southeast-Asia. These birds often live in the vicinity of human settlements and in parks and feed on fruits, nuts, buds and leaves.